One of my favourite games recently is called Codenames. It’s a simple word game that is as simple as it is ingenious. 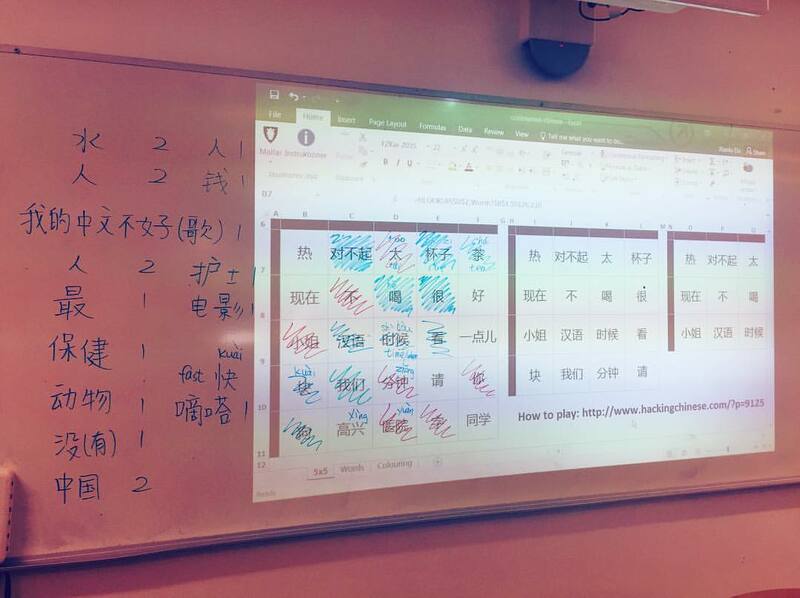 While the game is designed with native speakers of a language in mind (just like most other word games), in this article I will introduce how you can use this wonderful game to learn and/or teach Chinese. I will explain how the game is played, how it can be adapted to Chinese and provide you with a tool so it becomes easier to get started. Codenames is a game designed by Vlaada Chvátil and has won several awards, including the prestigious Spiel des Jahres. It seems to go down well with gaming nerds and normal people alike. Since I don’t want to spend this entire article discussing how the game is played, I’m going to link to a video that explains it well. Please note that while the original version requires at least four players (two teams of two players), two-player games are definitely possible. If you can’t or don’t want to watch the clip, you can check this page. If you think the above clip is too short and you want a fuller video explanation, you can check this video. To help you with this, I have created a spreadsheet that automatically generates 5×5, 4×4 and 3×3 grids, filling them with words from HSK1, HSK2, HSK3, HSK4, HSK5, HSK6 or all of them, depending on what you choose. It then presents this in a grid you can either print, display on your phone or show your class using a projector. You can also print key cards (the cards that show which word belongs to which team and where the assassin is). 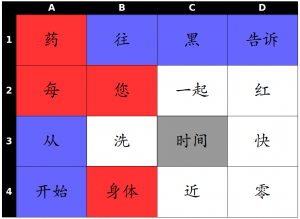 Please note that using the HSK words directly might not be a good idea since some of them will be very tricky, such as particles and grammar words. It probably works best if you select words manually and use the custom option! Codenames really is a great game, but my saying so probably won’t convince you. Try the game, perhaps in your native language first, then try playing it in Chinese. If you do, please leave a comment; I’m eager to hear about your experience! I am a Chinese teacher in Australia. I think this is a great game, but I am very confused and still have no idea how to play the game in Chinese. Is there any other detailed information I can read further? 太棒了！Great effort! I have to get my head round the rules of codename. But the spreadsheet is useful for generating good old-fashion bingo cards too! This is a great idea; I’ll have to try it. In your experience, do people give clues mainly about the meanings of the words? It seems like you could do a lot of clues that are about the characters, too (like names of brushstrokes or radicals), or combine both meanings and appearances. Yes, students mostly refer to the meaning. The only time when I’ve seen clues referring to characters is when there are obvious connections, such as sharing the same radical in an obvious way. However, since we mostly play with words and not single characters, this rarely happens. I think the game would be very different if you played with only single characters, though! Worth trying, perhaps.